A broad umbrella entry for albums with multiple different contributors that cannot easily be categorised anywhere else. On their sophomore, Stoic Dissention's music has taken a less raw, mellower direction. 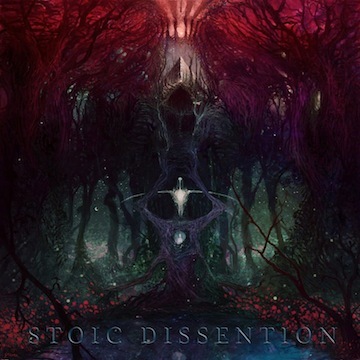 Stoic Dissention caused quite a stir at doom-metal.com when they sent their first material in to be reviewed, Senium, in 2011. They had achieved this rare mixture of blending Black Metal, Death Metal and Doom Metal in a way that didn’t feel either superficial or boring. A year has passed and Stoic Dissention have just released their debut, entitled Relinquished. Back in 2011, I had mentioned similarities with bands like Ahab, Asunder or Mournful Congregration but also bands like Darkthrone or Obskure Torture for the rawer and "blacker" parts, which actually made Senium so outstanding and different from other releases. On Relinquished, Stoic Dissention have gone into an altogether different direction. The raw aspects have been left aside, except for a brief moment, and that gave birth to something a lot more sophisticated. Their sound, which was so cold and despair-inducing, mutated into something warmer and more organic, which makes me think of a regression to more carnal feelings, as if they felt the need to climb back into their mother’s womb. The differentiation from Senium goes even further with the appearance of guttural vocals where most of the previous material featured Black Metal vocals which, at the time, Zachary had identified as better representing what they wanted to express. The Into Darkness-like cover art from 2011 has now gone all colourful with a rather 70s prog, almost cosmic, vibe. So, what? Did the band just shed its chrysalis and turn into a flamboyant butterfly? Has the music so drastically changed that it seems two different bands were behind it? Not really: the real progression lies in the construction of hallucinatory landscapes which, in 2011, reminded me of bands like Mournful Congregation or, even more, like Asunder. With, for instance, the addition of flute parts, we’re even sometimes on the verge of meeting post-rock with something close to what Seidr would offer. It feels a bit Canadian, a la GY!BE somehow, and where Senium had this “Winter” vibe filled with visions of ruins and sordid despair, Relinquished develops vistas of cosmic grandeur and even nature worship. This transition also shows “mechanically” in that Senium comprised 6 tracks where its successor only has 3 songs of much vaster proportions. Which, in the end, gives me mixed feelings. I can’t help but think that Stoic Dissention should have further developed the music that they gave us with Senium, because this almost ideal Black Doom feeling is so seldom worked with class and they could have reached perfection with a little persistence. On the other hand, it would be a bit selfish not to acknowledge the fact that each band is bound to reach and overcome new limits, explore different areas and, past the initial frustration, one can only admit that with Relinquished, Stoic Dissention really gained maturity and cunning musicianship. Though the continuity between the two recordings may look tenuous at best, it makes the experience all the richer and shows, if proof was really needed, that Stoic Dissention have not yet finished surprising us. Visit the Stoic Dissention bandpage.